The product and product details pages offer a variety of adjustments that may be made here. 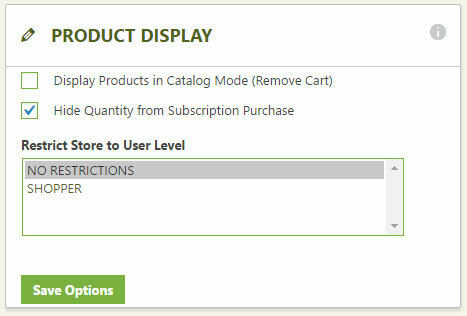 Display Products in Catalog Mode: This will remove the ‘Add to Cart’ from products and the cart system, making the products viewable, but not able to be purchased. Hide Quantity from Subscription Purchase: Because subscriptions by their nature are a sign-up, not a purchase of a retail item, there is often no need for a quantity and it may be hidden here. Restrict Store to User Level: By default, shopper is the normal status of users and there are no restrictions to viewing the store. If you would like to restrict access to the store, you may do so by user level. Customers would need to sign-in via their account before viewing the store if restricted. Show Breadcrumbs: You may turn on/off the ability to show breadcrumb feature on details page. Show Magnification Box: You may turn on/off the roll-over magnification system on the product images. Show Large Image Popup: You may turn on/off the large image popup that is used when a customer clicks on the image. Show Model Number: You may turn on/off the model number from showing on the product details page. Show Product Categories: You may turn on/off the categories that the product exists in. These are often good for SEO. Show Manufacturer: You may turn on/off the manufacturer from showing on the product details page. Show Stock Quantity: You may turn on/off the stock quantity from showing on the product details page. 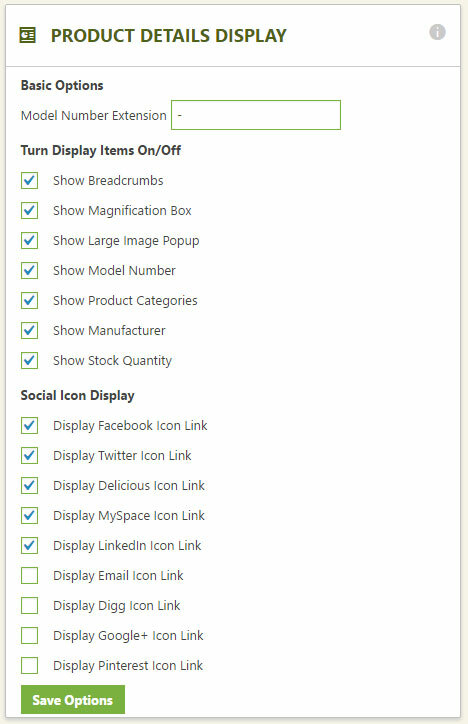 Social Icons: This will turn on/off the display of various social icon links for each product details page. User Must be Logged in to Review: You may turn on/off the ability to require a user to be logged into easycart in order to leave reviews. Often a good choice to have on if SPAM is becoming a problem. 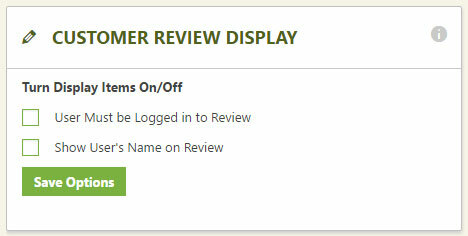 Show Users Name on Review: You may turn on/off the display of the users name or you may leave them anonymous. Hide Price for Seasonal Products: If you edit a product and have it selected as a seasonal product, you can choose to turn on/off the price from displaying for these products. Hide Price for Inquiry Products: If you edit a product and have it selected as an inquiry product, you can choose to turn on/off the price from displaying for these products. 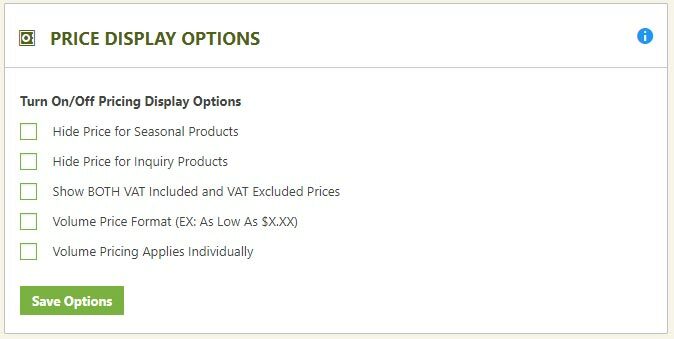 Show BOTH VAT included and VAT excluded Prices: If using VAT you can choose to show both include and excluded pricing at the product details view. Volume Pricing format: If selected, it will show the ‘As Low As’ to the pricing of items, giving the customer an indication that there is alternative pricing available. Volume Pricing Applies Individually: If you have volume pricing enabled on a product and use different options to a product, you may specify that volume pricing applies globally to a product, or it applies to individually selected options differently. 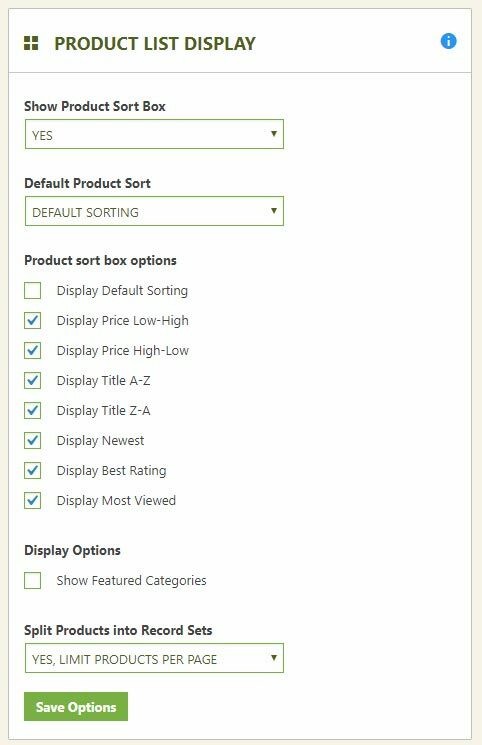 Show Product Sort Box: You may choose to show or hide the product sort feature on the product page. Default Product Sort: You may choose to have a default sort, or specify which sort order you would like customers to start with. IF you choose anything other than ‘Default Sorting’, the ability to manually sort products from the front-end will be ignored. Product Sort Box Options: This is the list of sortable options that are predefined and customers may choose from. You can specify here if you want to enable/disable each of them individually, though it is often best to leave them all on for customers to decide. Show Featured Categories: If selected, there will be featured categories listed at the top of the product page. Split Products into Record Sets: You can choose to paginate and have recordsets of products, or you can choose to show all products and skip pagination. Remove Stock When Added to Cart: If you enabling Quantity Tracking at the product level, either Overall Quantity Tracking or Option Item Quantity Tracking, the normal situation is to remove the items from inventory when the order is placed. However, you can enable this feature, and your EasyCart will temporarily remove the items from inventory when the user ‘Adds to Cart’. You can specify how long that item will remain in their cart per hour basis. Hours Before Returning Cart Stock: If enabled, the time will look at when the user put the items in their cart and remove them back to the public after this amount of time has expired. Allow Customers to Subscribe to Stock Notifications: This option will give the user a entry spot for their email and submit button on a product that is out of stock. Once you update inventory to something, it will automatically send an email to the user that it’s back in stock.